British songstresses are beating their male counterparts in the money charts, with Adele heading a female-dominated list of the UK's richest young musicians. The multi-Grammy winner has amassed a fortune of £20 million, elevating her above Cheryl Cole, Leona Lewis and Katie Melua in this year's Sunday Times Rich List. But Britain's leading men remain at the top of the country's wealthiest screen stars. Despite the Harry Potter film franchise coming to an end, its star Daniel Radcliffe remains the richest young actor. The 22-year-old is sitting on a personal fortune of £54 million, up from £48 million in 2011, according to the Sunday Times. Twilight heartthrob Robert Pattinson comes second in the list, which looks at actors and actresses aged 30 and under. Keira Knightley, who is the third richest young British movie star, tops the list when it comes to models. The face of Chanel is worth £30 million, above Kiera Chaplin, the model granddaughter of silent movie giant Charlie. Radcliffe's former co-star Emma Watson has seen her Potter millions supplemented by a subsequent career modelling Burberry, catapulting her to the position of third richest British model, with £26 million. 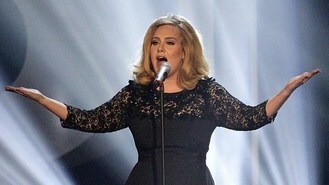 But it Adele who has seen possibly the biggest leap in fortune amongst Britain's bright young things. Her personal fortune has increased by £14 million over the last year, according to the Sunday Times Rich List. Of the top ten wealthiest young musicians, eight are women, with R 'n' B star Craig David and Scottish singer Paolo Nutini ensuring it is not a female only list. The Sunday Times Rich List will be published in full on April 29. Chris Martin has revealed Coldplay are inspired by kids' film Kung Fu Panda 2. Rochelle Wiseman appears to have accidentally revealed her wedding date to Marvin Humes on the internet. Robin Gibb is "fighting" his health problems, according to his son, who said the singer was heartbroken to miss the premiere of their debut classical work. Adele heads a female-dominated list of the UK's richest young musicians, who are beating their male counterparts in the money charts. Joe McElderry has revealed that he would like to work with N-Dubz star Dappy. Wretch 32 says that he would be a "rubbish" TV judge because he is so indecisive. There'll be no Guns N' Roses reunion at this weekend's Rock and Roll Hall of Fame ceremony - Axl Rose says he will not attend and is declining his induction into the hall. Pete Doherty said he has "a long way to go" before he gets off drugs but is planning to enter rehab later this month. One Direction are facing legal action over their name from a US band who claim to have been using the same title for almost a year longer.